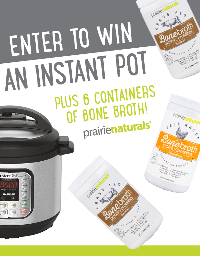 Prize: Instant Pot and 4 Prairie Naturals Bone Broth (prize must be picked up @ one of their locations). Statistics: This contest was opened by 93 and entered by 10 ContestChest.com members. 11% of those who opened the contest, entered it.